Making zucchini pasta is great for those following a low carb, gluten free, or paleo diet, using vegetables instead of pasta/noodles. With the right tools it's very easy to make. 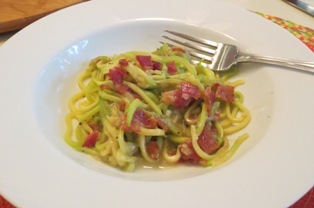 Zucchini noodles can be eaten raw or cooked with you favorite sauce or other ingredients added. 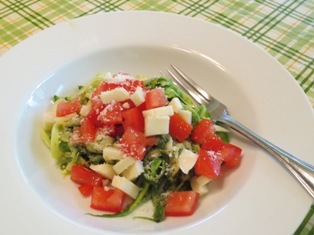 For those who maintain a raw foods diet, the zucchini pasta can be eaten as is with any desired added vegetables. 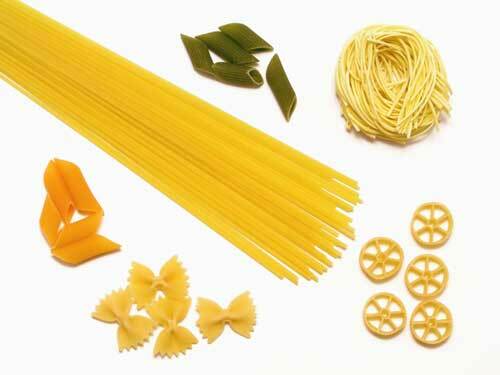 The noodles can also be lightly steamed or sauteed in a little olive oil or butter. If you are cooking the noodles, I would recommend using about 1 medium zucchini per serving, as the noodles will decrease in volume when cooked. Cooking times should only be 2-3 minutes to prevent the zucchini from becoming too mushy. Then add your favorite sauce or other ingredients. If you want zucchini noodles that more closely resemble actual pasta in color, peel the zucchini first. If you don't mind the green color in your pasta, leave the skin on. You can make long, thin ribbon noodles using a vegetable peeler or mandoline by simply cutting long, thin strands down the length of the zucchini. 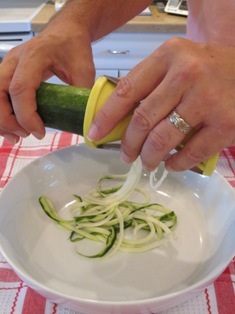 You can also cut zucchini noodles with a special spiral vegetable cutter, which is my favorite method. There are a few different types of spiralizers. I own two: a handheld spiralizer and a horizontal hold spiralizer. The handheld spiralizer that I own is Briefton's Vegetable Spiralizer. It has 2 blades for 2 different thicknesses of vegetable strands; both hold up well when steamed or sauteed. You use this spiralizer like a pencil sharpener. Simply put the zucchini in the center of the slicer's cone and twist it with consistent forward pressure. 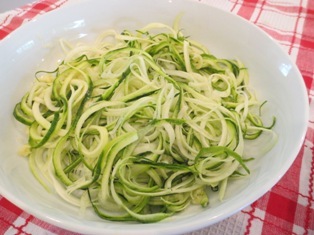 As you twist the zucchini, the slicer produces endless spiral strands which are your noodles. 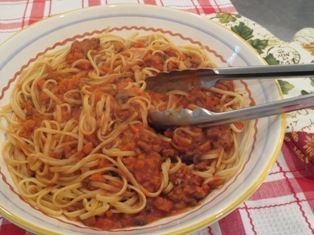 The spiralizer can also be used to make pasta with other firm vegetables such as carrots. Heat the olive oil or butter in a large skillet over medium-high heat. Add the zucchini noodles and saute for 1-2 minutes, tossing gently. Remove from the heat; stir in just enough pesto to coat the noodles. Divide the noodles between 2 serving bowls. 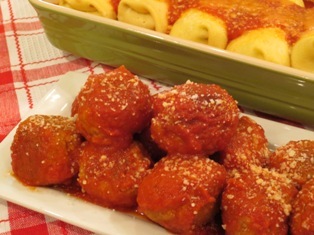 Top each portion with half of the cubed tomatoes and mozzarella. With a paper towel pat the sea scallops dry; season them with salt and pepper. Place a large skillet over medium-high heat; coat the bottom with a thin layer of canola or grapeseed oil. When the oil is hot, add the scallops to the skillet, flat side down. Allow the scallops to sear and brown for 2 minutes without moving them. Turn the scallops over and sear them on the other side for 1-2 minutes. They should be nicely browned on both sides and slightly springy to the touch. 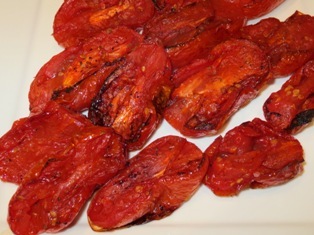 Transfer them to a plate and set aside. In the same skillet, heat the butter and olive oil over medium heat. Add the shallots and cook for about a minute. Add the chicken broth and lemon juice; bring to a simmer. Toss in the zucchini noodles and cook for a 1-2 minutes, gently tossing the zucchini until it is just tender and the liquid in the pan has reduced slightly. Stir in the goat cheese until it has combined with the liquid in the skillet to form a sauce. Season to taste with salt and pepper. Remove from the heat. To serve, place a mound of zucchini noodles on a plate, and place the scallops on top. Top each serving with some julienned basil leaves. I've owned several food mills over the years, and in my opinion, this one is the best. The advantage of a food mill over a food processor or blender is that it separates the skins and seeds from the fruit or vegetable pulp. It is the perfect tool for preparing fresh purees, sauces, and soups. It includes 3 stainless steel grinding discs for fine, medium and coarse textures. Use the fine disc for homemade jellies, creamy sauces and baby food, the medium disc for applesauce and vegetable soups, and the coarse disc for mashed potatoes and chunkier sauces. A handheld spiralizer is the cheapest option. You may want to try it first to see if you like spiralized vegetables. It is the harder of the two types to use for all but very small quantities. You are constantly twisting the unit and your hand gets very tired. Another drawback is that it will only accomodate a vegetable with a diameter of around 2-inches/5cm or less. Horizontal hold spiralizers are slightly more expensive than handheld models but you can still purchase one for around $20. These manage much larger diameter vegetables than the handheld devices. So you can cut apple spirals for apple slaw, onion rings, potato chips, or curly sweet potato fries in seconds. 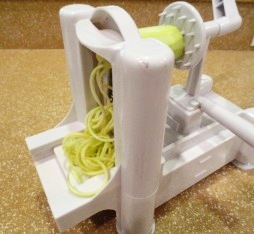 I prefer this spiralizer for the thickness of the noodles it creates. Most horizontal hold spiralizers are about the size of a toaster and function like a giant pencil sharpener. They usually include 3 sets of blades: 1/8-inch spacing, 1/4-inch spacing, and straight blade for ribbon cuts. The units come apart for easy washing. To operate the horizontal hold spiralizer, cut both ends of the vegetable flat. Press one end onto the clamp or steel spindle on one side of the spiralizer and press the other end onto the turning wheel spikes. Simply turn the crank in a clockwise motion and the spiral slices will come out the other side. A small core about the size of a pencil from the center of the vegetable will remain, which you can discard. Cook the bacon in a medium skillet until crisp. Transfer the bacon to a paper-towel lined plate. Reserve about 1 tablespoon of the bacon grease in the skillet; remove any extra. When the bacon has cooled, crumble into bite-size pieces. Add the butter to the skillet and place over medium-high heat. Add the red pepper flakes, garlic, and black pepper. Saute for 1-2 minutes to combine the flavors. Add the zucchini noodles and season with salt. Gently toss the noodles with the butter mixture; cook for 2-3 minutes. Add the Parmesan and pecorino cheese and gently toss to coat the noodles. Transfer to a serving dish. Sprinkle the bacon bits on top and top with a little more black pepper. NEED MORE RECIPES FOR SPIRALIZING? Features recipes for breakfast, snacks, appetizers, sandwiches, soups, salads, casseroles, rices, pastas, and even desserts that are easy to follow and completely fresh and flavorful. The author tells you how to customize them for whatever vegetables you have on hand and whatever your personal goal may be-losing weight, following a healthier lifestyle, or simply making easy meals at home.